With a cast and crew ages 14 to 22, the young adults of the VTC have been preparing for weeks to star in the awarding-winning musical comedy that took home the 2005 Tony Award for Best Book of a Musical. 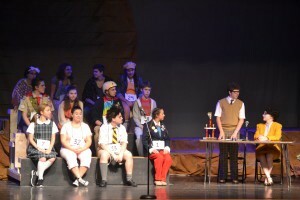 “The 25th Annual Putnam County Spelling Bee” tells the story of the kids, and adults, who gather for the annual, and abnormal, spelling bee of the geographically ambiguous Putnam County. According to show director Sandi Makofsky, the show blends funny and clever dialogue with the surprisingly poignant backstories of the show’s comedic characters to create a story that stretches the abilities of the performers. “I think everyone will get something out of it because it’s about conquering your fears and being the outcast and being accepted ultimately at the end, and I think we all feel like that at some point in our lives,” Makofsky said. 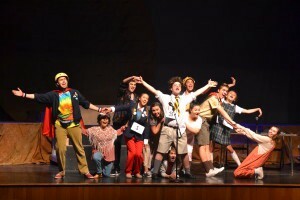 “The 25th Annual Putnam County Spelling Bee” is also unique in how much shows can vary from production to production. Some productions have a small cast of nine, with additional spellers chosen from the audience, but the number of performers in the VTC cast is closer to 39, with those performers filling the show’s standard roles as well as those “audience members” selected to participate. When producing a show with young adults, Makofsky said it can be exciting and even empowering for the younger performers to take the tools they might have learned in previous classes and apply them with more freedom. “The kids who are in it have a good amount of experience, so there’s a comfort level between them, so for example if they’re rehearsing and they come up with something creative that’s not in the script, we add that in if it works,” Makofsky said. For 19-year-old Richard Kirby, who will be playing the role of spelling bee judge and vice principal Douglas Panch, he especially gets to exercise some freedom in his role, as he gets to choose certain words for other cast members to spell every night. With that in mind, Kirby said the show is never quite the same from night to night, which really keeps the performers and audience members on their toes. “One of the words you may hear in one of our shows is an Icelandic name for a glacier in southern Iceland called Eyjafjallajökull — you probably won’t spell that right because I don’t how to spell it either,” Kirby said. For 22-year-old Evan Newlin, who said he has longed for years to play the role of the show’s hyperactive, wild child Leaf Coneybear, he echoed Makofsky in admiring how the show can mix sharp comedy and surprisingly deep moments of emotion. “It’s never in your face, never ham-fisted or beating you over the head with a message — it’s just here’s a kid, here’s his story, here’s what he’s going through, now watch him spell, and you sort of get a feel for what this person is like or what they’re going to become,” Newlin said. The show will be held from Aug. 11–13 at 7:30 p.m. at Voorhees Middle School. Tickets are $15 and are available at www.voorheestheatre.org or at the box office.